Towards the end of last year I was intrigued to read and see many blogs, posts, and images reminding folks how many days we had left in 2018 and suggesting we end the year in a positive place. I took that to heart and went back to my own intentions for 2018 to try to make sure I was walking the walk to close out last year. My intentions were to be less stressed about our family meals (and everyone’s needs around these meals!) and to get over my breakup with running by biking. I feel like I did well in 2018 with both of my intentions and receiving my new Peloton bike for turning 46 didn’t hurt! This made me think about the end of 2019 – not the beginning – in deciding on my intentions for this year. What could I carry through to December 2019? For 2019, one of my intentions is that I want to keep my meditation practice going strong. Usually I meditate in the evening using the app Simple Habit for about 15-20 minutes. In all honesty I fit in five nights of meditation per week. Now that meditating is a part of my daily life, I miss it when I don’t get the time to meditate and I feel more stressed if I skip a day. At the end of 2019 I want to be able to look back and see my growth in this practice and how it’s helped me stay present in gratitude. For me, adopting a practice of meditation is more of a marathon, not a sprint. Given it takes 30 days to implement a new habit, I gave myself all of January to really stick to this plan. It worked! I’d encourage you to look back over the month of January and if you feel like you weren’t able to stick to your intentions, ask yourself how long you practiced your new behavior. This is why I prefer not adding “resolutions” to the beginning of the first day of a new year. 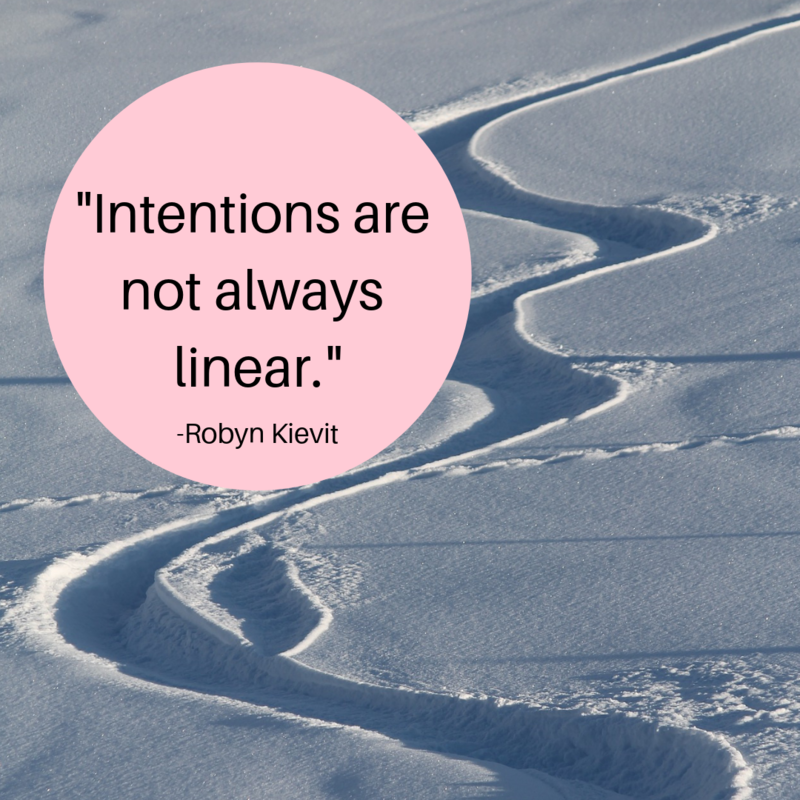 I look at intentions as new habits to strive for over the whole month of January. And beyond. Have you tried a diet? Whole30? Keto? A cleanse? Have you had food delivered to you by any meal service in smaller portions so you did not have to ‘think’ about it? Diets are always an option – always – but if you’re reading this now and have an appointment with me or will in the future let’s give other options a try first. After a few sessions with me or even within our Greater Boston Wellness Collaborative, you may find that diets are not of interest to you anymore. Maybe it’s easier for your mind to postpone the idea of a diet instead of giving up the idea of dieting entirely. This can also be true for a goal weight that is unachievable and unhealthy as well. Try giving up that number for a month to get used to a different way of thinking. Learning to tolerate some of the anxiety of giving up what is really a far-fetched and self deprecating ‘goal’ or ‘resolution’ may make you feel anxious in the short run. However, the experiment within is essentially helping you learn to live your life more consistently within your values over the long term. Remember, the healing process from a difficult relationship with your body, food, and mental health is often full of steps forward and backwards. Thus the image shared today in this issue, noting that our intention setting is not always linear. That’s ok. We’re human. And, in my book we are all winners!